DALLAS – Boasting a 50 percent improvement in city fuel economy, General Motors will showcase its new Chevrolet Tahoe Hybrid and GMC Yukon Hybrid – the only hybrid full-size SUVs – at the 2007 State Fair of Texas, Sept. 28 – Oct. 21. During the fair, the public can get a sneak peek of these Texas-built hybrid SUVs before they arrive in dealer showrooms. The Tahoe and Yukon Hybrids, to be built locally at the GM Arlington Assembly Plant, will deliver a 30 percent gain in overall fuel economy and, during certain driving conditions, will run on pure electricity. "The new Tahoe and Yukon Hybrid SUVs offer the best of both worlds to customers and complement the Texan lifestyle – all the capability expected of an SUV with better-than-ever fuel economy," said Ed Peper, Chevrolet general manager. 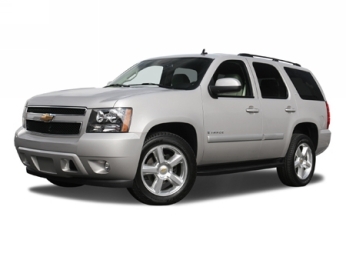 2008 Chevrolet Tahoe HybridCarrying on a tradition of comfort, performance and utility, the 2008 Tahoe and Yukon boast vastly improved fuel economy over their gasoline-only siblings. Two-wheel drive models, for example, deliver 21 mpg in the city, a 50 percent improvement over their 5.3L non-hybrid siblings and comparable to the much-smaller 2008 2.4L-equipped Toyota Camry sedan, according to www.fueleconomy.gov. The Tahoe and Yukon Hybrids’ 6.0L V-8 engine is equipped with the GM Active Fuel Management system, which disengages half of the engine’s cylinders when full engine power is not needed, allowing the engine to move seamlessly from V-8 to V-4 on driving demands. Electric-only propulsion is available up to 30 mph, which is key to reducing fuel consumption in heavy stop and go traffic – like being caught in DFW metro area traffic. Electric power assists the engine to save fuel during brisk acceleration or additional pulling power for towing. During vehicle deceleration, fuel is cutoff to the engine and the hybrid system’s battery pack is recharged via regenerative braking. "Building the full-size SUV hybrid vehicles locally is a perfect fit for Texas," said Alicia Boler-Davis, GM Arlington plant manager. "Most auto manufacturers offer hybrid vehicle technology only in smaller vehicles with less room for passengers and cargo. In Texas, we know transporting family and towing boats, campers and trailers is a way of life. GM is proud to bring a green alternative fitting for our fellow Texans needs and lifestyles." GM’s Active Fuel Management technology, which seamlessly shuts down half of the Vortec V-8’s cylinders to improve fuel economy when full engine power is not needed. 2008 Chevrolet Tahoe HybridGM’s Arlington Assembly plant has been manufacturing vehicles in Texas for 54 years and is a prime example of a high-tech automotive manufacturer. With 2,700 employees (2,500 hourly employees represented by UAW Local 276), the manufacturing facility builds the Cadillac Escalade and Escalade ESV, in addition to the Chevy Tahoe and Suburban and GMC Yukon and Yukon XL.